Resume 'line' command and with "ortho" mode activated, decide the first point of the line on the screen, then move the mouse on the right to create an horizontal line. Now instead of clicking the second point of the line, dial a number with the keyboard, such as 100 and then press Enter or Right click twice to confirm and exit the command. As you understand, you have just made a line long “100”, but what is this value...? In AutoCAD these is a hundred units, but you decide how to draw so these units could be consider 100 millimeters, centimeters or meters (or feet and inches). It also depends on what you are drawing so there may be 100 mm of a metal object to draw for metalworking, or 100 cm of the side of a wooden table, or 100 meters of fence land. Generally, I am happy with the cm, but it is good to learn how to handle various situations. The thing to keep in mind however is that in AutoCAD we must generally think to draw in full scale 1:1! I mean that if I have a room of 4x4 meters and consider it to draw it in centimeters, will draw the long walls 400 units, which will consider just "centimeters", or 4000 units which will consider "millimeters". In general then, you will need to draw by entering the actual measurements of what you represent, except in cases of enlarged details that you'll have to do on the same table. When it's time to print the drawing we set a scale "to printing" as needed and here things will change based on the units with which we have interpreted the drawing (cm. or mm.). Let's say, for the print settings, it might be more correct to draw considering the "mm", but we'll talk about this during the course. Setting units in the "Format" menu. Let's then see another important approach to manage units. 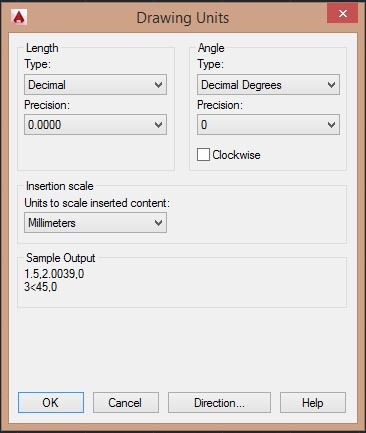 From the menu "format" , click on "Units .."
In the window that appears, click on the popup menu items "length" and "angle", respectively, sets "Decimal" and "Decimal Degrees" , as in the picture. 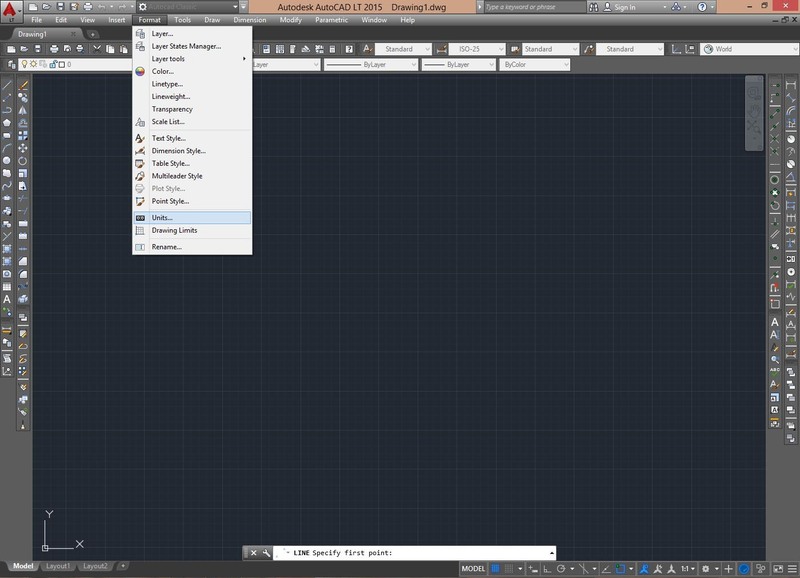 As you'll notice AutoCAD can be set for different types of units, such as "inch", which correspond to the "Architectural". In our case the decimal units should be used for both the length and angle. Attention: the unit settings menu does not apply in a general format for the program, but in this case, affect each individual "files" that we will made. Click "OK" to confirm and close the window. We will back on this when we print our design.